If you want to make a difference in the lives of underserved populations, consider earning an online doctorate in human services. This terminal degree prepares students to take on leadership roles in organizations that serve people in need, such as those who suffer from addiction, poverty, mental illness, or abuse. Earning a doctorate in human services online prepares you to apply specialized skills and research to create effective policies, protocols, and legislation within human services organizations. In the coming years, growing populations of people requiring medical and mental health services will drive an increase in human services positions. As a result, the Bureau of Labor Statistics (BLS) projects the need for social services managers to increase 18% between 2016 and 2026 — more than twice the average rate of growth for all other occupations in the country. Because numerous types of degrees fall under the umbrella of “doctorate in human services,” the following sections display top-ranked programs from several related ranking articles on our website. What Else Can I Expect From an Online Doctorate in Human Services Program? 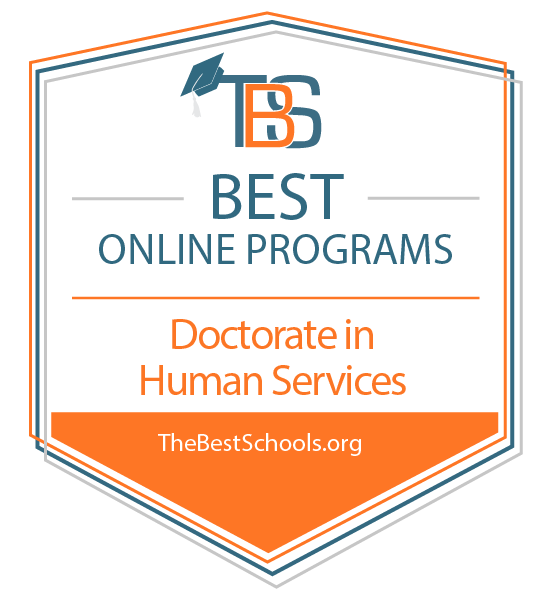 Online Doctorate in Human Services Degree Program Ranking Guidelines: We selected the degree programs based on the quality of program and range of courses provided, as well as school awards, rankings, and reputation. Capella University, a private, for-profit university established in 1993, offers two online doctorate in human services program options: an online doctor in human services, and an online Ph.D. in human services. While the doctor of human services focuses program on professional practice, the Ph.D. in human services focuses more on research and theory. Both prepare students to advance a variety of careers and positions in the field. The online Ph.D. in human services degree program comes with three specialization options, in multidisciplinary human services, nonprofit management and leadership, and social and community services. The program requires 92 quarter-credits for completion, a dissertation project, and comprehensive exams. Courses are lead by actively-practicing faculty covering topics such as case analysis, multidisciplinary practice, diversity in the workplace, advanced research methods, and ethics. The online doctor of human services offers two specialization options in advanced program evaluation and data analytics, and leadership and organizational management. The program requires 72 quarter-credits for completion, as well as a doctoral capstone. Courses are lead by actively-practicing faculty covering topics such as grant writing, data analytics and program evaluation, multidisciplinary practice, ethics and leadership models, and action research methods. Students in either program benefit from committed doctoral support, real-world education from scholar-practitioner faculty, asynchronous course delivery and 24/7 access, and a multidisciplinary approach. Capella University is regionally accredited by the Higher Learning Commission (HLC). Ashford University, an online, for-profit university, enrolls over 36,000 students in an array of entirely online undergraduate and graduate programs. Among its offerings is an online doctor of philosophy in human services degree program. The online Ph.D. in Human services requires 62 credit hours for completion, including 11 core courses, one elective research course, and five specialization courses. Students may choose from three specialization options, in the areas of mental health administration, nonprofit management, or standard human services. Regardless of the chosen specialization, the program develops advanced knowledge and skills in human services. Students prepare for leadership roles and learn to assess human services structures, evaluate and implement concepts, formulate strategies, and advocate for policies and practices. The program requires students to complete a doctoral capstone and dissertation. Courses are completed in six-to-nine week segments. Applicants must have a minimum of a master’s degree for admission. Students benefit from 24/7 technical support. Ashford University is accredited by the WASC Senior College and University Commission (WSCUC). Walden University, an online for-profit university established in 1970, enrolls around 50,000 students in a wide selection of undergraduate, graduate, and professional degree programs. Among its offerings is an online doctor of philosophy in social services degree program that prepares students for advanced positions in an array of human services careers. The online Ph.D. program offers 15 options for specialization, in areas such as advanced research, community and social services, criminal justice, family studies and intervention, gerontology, and military families and culture. The wide selection of specializations allows for students to fill any conceivable professional niche in human services by focusing on the specific area in which they wish to help. Regardless of the specialization chosen, students gain the advanced knowledge and skills necessary to effectively analyze problems, develop and implement strategies, and serve diverse populations of people. The online Ph.D. program also comes with two track options, designed to serve students of all levels of experience. Track I is for students who hold a master’s degree from an accredited university in human services, counseling, social work, or psychology, and is the shorter path of the two, requiring just 83 quarter-credits. Track II is for student’s holding a bachelor’s degree, or a master’s degree in a non-related field, and requires 108 quarter-credits. Both tracks require a dissertation, a professional development plan, and four periodic campus residencies. One of the state's flagship universities, Oregon State University offers several of its programs online. One such distance option is the university's online Ph.D. in counseling, which requires students to complete a total of 150 quarter hours to graduate. The program runs on a cohort model, providing students with one-on-one advising from a faculty member. Participants complete courses in a hybrid format, combining online coursework with twice-quarterly residencies in Wilsonville, which is accessible from the airport in Portland. All applicants must already hold a master's degree in counseling or an adjacent field, earned with a minimum GPA of 3.0. The program accepts students for the spring, summer, and fall terms. Although Oregon State is a public university, all online students enrolled in the counseling program pay the same per-credit tuition, regardless of their state of residence. Oregon State University is regionally accredited by the Northwest Commission on Colleges and Universities (MWCCU). The counseling program is accredited by the Council for Accreditation of Counseling and Related Educational Programs (CACREP). The University of West Georgia's psychology department focuses on humanistic and transpersonal psychology, defining psychology as the “holistic study of human experience.” Students in this department follow an interdisciplinary, liberal arts approach to psychology that incorporates philosophy, art, anthropology, literature, sociology, religion, and other disciplines. Learners at UWG can also opt to pursue a Ph.D. in counseling online. The school's 60-credit professional counseling Ed.D. program runs on a cohort model, welcoming 12 students each summer. Learners complete two courses per term and only need to visit the school's main campus in Carrollton, Georgia at the beginning of the program for an orientation. All applicants must have at least three years of counseling experience, a master's degree in counseling, a counseling license, and minimum scores of 151 and 142 on the verbal and quantitative portions of the GRE, respectively. The University of West Georgia is regionally accredited by the Southern Association of Colleges and Schools Commission on Colleges (SACSCOC). Mississippi College is the state's largest private college and one of the oldest Baptist-affiliated schools in the nation. The college hosts many popular distance education programs, including online doctoral degrees in counseling. The school's 72-hour professional counseling program runs on a cohort model, combining practice, research, and theory. Students complete theoretical coursework related to clinical assessments and group dynamics, as well as 12 hours of doctoral internships. All students must also undertake a capstone project and complete a series of competency assessments over the course of the program, including qualifying and comprehensive examinations. Students must enroll year-round and take courses each term, including during the summers. Applicants must have two years of counseling experience, a minimum GPA of 3.25 in previous graduate work, a licensed professional counselor credential, and satisfactory GRE scores. Transfer students may transfer up to 21 hours into this program. See more of the Best Online Doctorate in Counseling Degree Programs. Located in southwest Pennsylvania, California University of Pennsylvania is home to the first regionally accredited doctor of criminal justice degree in the nation. The 42-credit program focuses on in-depth policy analysis and practical issues like recidivism, the use of appropriate force, and federal consent decrees. Coursework in this online Ph.D. in criminal justice program covers subjects like leadership in criminal justice agencies, corrections, and forensic science techniques and technology. While most graduates pursue careers in academia, nearly one-quarter of them work in law enforcement, policy making, and the private sector. Cal U offers this program using a cohort model, with students beginning their coursework in the summer. The school requires students to attend two five-day summer residencies. While the program does not include a dissertation, students must pass comprehensive exams and develop a professional research portfolio. Eligible applicants must hold a master’s degree in criminal justice or a related field from a regionally accredited college or university. Additionally, they must submit transcripts and provide a writing sample, a personal statement, two letters of recommendation, and a current resume. Applicants must have earned a 3.50 GPA or better. California University of Pennsylvania is regionally accredited from the Middle States Commission on Higher Education (MSCHE). Students earning Nova Southeastern University’s Ph.D. in criminal justice online can pursue careers in academia, criminal investigations, consulting, and management. The program’s interdisciplinary approach leverages research and best practices to explore the cause of crime and how to prevent and investigate it. Students may choose from concentrations in behavioral sciences, juvenile justice, and organizational leadership. All students take 33 credits of core classes that cover topics like criminal law, crime theories, research methods, and applied statistics. At the end of the 60-credit program, students must complete and defend a dissertation in order to graduate. Applicants must hold a master’s degree from a regionally accredited college or university with a GPA of 3.0 or better. They must also provide three letters of recommendation, a 300-word personal statement, and a resume. Additionally, applicants must complete an in-person or phone interview with program staff. NSU is regionally accredited from the Southern Association of Colleges and Schools Commission on Colleges (SACSCOC). See more of the Best Online Doctorate in Criminal Justice Degree Programs. Located in Lynchburg, Virginia, Liberty University is a Carnegie-classified doctoral research university offering over 550 programs of study to more than 110,000 students. The Christian university teaches nearly 300 programs through online learning, including 28 doctorates. Founded in 1931, the University of Louisiana at Monroe is one of nine universities in the University of Louisiana system. In 2016, enrollment at ULM topped 9,000 students, while the school's online programs reached over 1,200 distance learners. The University of Louisiana at Monroe is regionally accredited by the Southern Association of Colleges and Schools Commission on Colleges (SACSCOC). The MFT doctorate is also fully accredited by the Commission on Accreditation for Marriage and Family Therapy Education (COAMFTE). For over 25 years, Amridge University has been a leader in online education. Today, the Church of Christ-affiliated university employs distance learning in every program. Based in Montgomery, Alabama, Amridge enrolls around 700 students. See more of the Best Online Doctorate in Family Counseling Programs. One of the biggest names in distance education, Liberty University offers 289 online programs. The school’s online doctoral degree in healthcare management never requires students to visit the campus in Lynchburg, Virginia. The program’s 60-credit curriculum combines foundational business courses with major-specific coursework in legal and ethical issues for healthcare professionals and managing human capital in healthcare. While campus visits are not mandatory, students may choose to complete certain on-campus intensives, which allow them to accrue credits more quickly. All applicants must possess a relevant master’s degree with a minimum GPA of 3.0. Transfer students may apply up to 15 credits toward their degrees. The program delivers coursework asynchronously, with each online course lasting eight weeks. Liberty University is regionally accredited from the Southern Association of Colleges and Schools Commission on Colleges (SACSCOC). Based in Mount Pleasant, Central Michigan University caters to students far beyond the state borders of Michigan through its extensive online presence. One of the school’s strongest online programs is the doctorate in healthcare management. The 63-credit program runs on a hybrid cohort model, requiring students to complete 51 credits of didactic (classroom/theory) coursework. This model includes 15 asynchronous online courses and six on-campus intensives, lasting two and a half days each. A dissertation makes up the remaining 12 credits. The program’s didactic curriculum includes studies in leadership, public health, and quantitative analysis. Online courses last eight, 12, or 16 weeks, depending on the material. Applicants must have a master’s or professional degree to apply. If a qualified student is not accepted, CMU places them on a one-year waitlist to try and put them in the next year’s cohort. Central Michigan University is regionally accredited from the Higher Learning Commission (HLC). Located in Jackson, the University of Mississippi’s DHA degree online uses blended learning and a cohort model, combining asynchronous online coursework with limited on-campus requirements. Though the program primarily caters to part-time students who are also working professionals, there is a full-time option available. Students can expect to complete the program in nine semesters or approximately three years. The program’s curriculum includes coursework in health economics, health research, and quality processes in health organizations, in addition to a capstone doctoral project. All applicants must already have a master’s degree, with a GPA of at least 3.0. GRE scores are also required. The program accepts students exclusively for its summer cohort that includes 10-15 students per unit. The University of Mississippi is regionally accredited from the Southern Association of Colleges and Schools Commission on Colleges (SACSCOC). See more of the Best Online Doctorate in Healthcare Administration Programs. The University of Illinois at Urbana-Champaign is regionally accredited by the Higher Learning Commission (HLC). The University of Arkansas has offered an online doctoral human resource management degree since 2001. The 96-credit program delivers its coursework primarily asynchronously but does include a single on-campus residency. The curriculum includes coursework in organizational development and statistics in addition to a dissertation and a candidacy exam. Though not a requirement, students may also choose to complete a practicum experience as an elective. The University of Arkansas is regionally accredited by the Higher Learning Commission (HLC). Based in Lynchburg, Virginia, Liberty University has become one of the nation's leaders in online education over the past decade. The school currently enrolls over 110,000 students -- including 30,000 military students -- many of whom take courses online. As such, the school's online doctorate in human resource management program is one of the best of its kind. Students enrolled in the program can complete the 60-credit curriculum without ever having to visit campus in Lynchburg unless they choose to complete optional on-campus intensives. Liberty University is regionally accredited from the Southern Association of Colleges and Schools Commission on Colleges (SACSCOC). The school's business programs have received national accreditation from the Accreditation Council for Business Schools and Programs (ACBSP). See more of the Best Online Doctorate in Human Resources Programs. Founded in 1940 as the fourth school of public health in the nation, the Gillings School of Global Public Health at UNC maintains a reputation as one of the top U.S. schools in the field. Designed for working healthcare professionals, the executive online DrPH requires 45-51 credits of coursework, which students complete within three years. Unlike the research-based focus of an online Ph.D. in public health, the DrPH emphasizes practice and leadership skills. The program admits an incoming class of 12-15 students each year, with sessions beginning in the fall. The DrPH curriculum splits into leadership, public health, and research domains, with the third year dedicated to doctoral dissertation work. Students engage in at least one applied practice experience and visit the Chapel Hill campus in the fall, spring, and summer semesters during their first two years. The University of North Carolina at Chapel Hill is regionally accredited by the Southern Association of Colleges and Schools Commission on Colleges (SACSCOC). Gillings programs are fully accredited by the Council on Education for Public Health (CEPH). Located in Baltimore, Maryland, the Bloomberg School of Public Health at Johns Hopkins University offers 26 graduate programs -- seven master's, three doctoral, and 11 combined degrees. Designed for professionals who already hold an MPH, the 64-credit doctor of public health focuses on evidence-based research, ethical issues, public health policy, and health promotion. DrPH candidates may choose from four concentrations: implementation science, health equity and social justice, environmental health, and health policy and management. The curriculum splits between 56 term credits in coursework and eight in a practicum and doctoral dissertation. Students have nine years to complete the program but may do so in as little as four. In addition to an MPH or equivalent degree, applicants must have at least three years of relevant public health industry experience. Johns Hopkins University is regionally accredited by the Middle States Commission on Higher Education (MSCHE). The online doctor of public health is fully accredited by the Council on Education for Public Health (CEPH). Through campuses in Tampa, St. Petersburg, and Sarasota-Manatee, the University of South Florida serves over 50,000 students. The university's college of public health offers 25 concentrations, over 100 online courses, and four graduate degree programs. The DrPH prepares practitioners for both leadership and advocacy in public health. The doctoral degree takes a scientific, interdisciplinary approach to examining public health problems in the U.S. and abroad. Students choose between two concentrations: advanced practice leadership and clinical laboratory science and practice. The DrPH program includes three evidence-based deliverables and demonstrates DrPH competencies across all curriculum domains. The hybrid program requires students to visit Tampa at least three times for condensed sessions or institutes. Prospective DrPH candidates must have an MPH, MHA, MSPH, or relevant master's degree with a minimum 3.0 GPA. The University of South Florida is regionally accredited by the Southern Association of Colleges and Schools Commission on Colleges (SACSCOC). The university's accredited online doctoral programs in public health are accredited by the Council on Education in Public Health (CEPH). See more of the Best Online Doctorate in Public Health Programs. Based 25 miles outside of Philadelphia, Pennsylvania, West Chester University offers an online doctor of public administration that trains students to work at the highest levels of public affairs and administration. Consisting of 43 credits, this doctor of public policy program emphasizes public sector financial decision making, strategic management, policy advocacy, and leadership. Candidates also gain advanced skills in methodological evaluation, preparing them to analyze and assess the effectiveness of public programs and policy. All coursework can be completed online. The program curriculum includes four major components: an administration core, a methods sequence, concentration electives, and a capstone seminar. Degree candidates choose their concentration electives from the academic areas of public policy and administration, geography and planning, criminal justice, or social work. The program concludes with a comprehensive exam that covers all major topics discussed in the administration core. West Chester University is regionally accredited by the Middle States Commission on Higher Education (MSCHE). A Christian, liberal arts school based in the city of Riverside, California Baptist University is home to around 9,000 students. The school offers an online doctorate in public policy that trains candidates to serve as expert leaders in social services, criminal justice, government, health management, and public policy. This 50-credit doctor of public administration caters to working professionals and is delivered primarily online through a modular, cohort format where students take one course at a time. Degree candidates complete most of the course sequence as a cohesive group, building a deeper sense of teamwork and communication. While most courses offer fully online learning, the program does require occasional campus residency sessions that feature intensive classroom coursework and networking opportunities between students and faculty. The program typically takes around three years to complete. California Baptist University is regionally accredited by the WASC Senior College and University Commission (WSCUC). A public school in southern Georgia, Valdosta State University offers a popular online Ph.D. in public policy. This advanced degree prepares graduates for career advancement at government agencies, nonprofits, and non-governmental organizations, building essential skills in leadership, communication, management, and problem solving. This practitioner-based degree builds on students' professional experience, emphasizing applied research and information development. Candidates can also choose from a variety of concentration options to suit their professional interests. This 54-credit doctor of public administration divides its curriculum into four major areas: core knowledge, theory and methods, electives, and a final capstone project. VSU offers most coursework online, although students must attend select residency sessions held at the beginning of each fall and spring semester. These weekend sessions give students the chance to participate in campus learning activities, workshops, social events, and networking activities. Valdosta State University is regionally accredited by the Southern Association of Colleges and Schools Commission on Colleges (SACSCOC). See more of the Best Online Doctorate in Public Policy Programs. Founded in 1740, the University of Pennsylvania is an Ivy League institution located in the University City area of Philadelphia. Penn offers online degree options in various subjects, including a DSW in clinical social work online, administered by the school of social policy and practice. This is a practice doctorate program, intended for clinical social workers with master's-level degrees who wish to further their education and career leadership opportunities. The program includes synchronous video lecture sessions two times per week and two on-campus immersion sessions during the three-year program. Applicants to the online Ph.D. in social work program at Penn must hold a master's degree in social work from an accredited program and demonstrate two years of practice experience after earning their master's degree. Graduates from the social work Ph.D. program online at Penn have gone on to work in patient care facilities, as well as institutions of higher learning, in academic, research, and administrative roles. The University of Pennsylvania is regionally accredited by the Middle States Commission on Higher Education (MSCHE). Founded in 1880, the University of Southern California is a private research university in Los Angeles. Similar to other social work Ph.D. programs online, USC's doctor of social work degree is designed for students currently working as social workers who wish to further their careers. Students earning their Ph.D. in social work online at USC must complete 42 credits over the course of the two-year program. Coursework is focused on two areas: advanced management practice in complex systems and innovation and leadership. In order to graduate, each student must complete a capstone project that addresses one of the 12 Grand Challenges established by the American Academy of Social Work and Social Welfare. USC's online Ph.D. in social work program includes synchronous coursework and two required six-day on-campus residencies, held in Los Angeles and Washington, D.C. The University of California is regionally accredited by the WASC Senior College and University Commission (WSCUC). The University of St. Thomas offers a Ph.D. in social work online in partnership with St. Catherine University. Students progress with their cohort through 45 credits over a three-year period. The school delivers its coursework synchronously as well as asynchronously, with a required two-week on-campus orientation and introductory course in Saint Paul, Minnesota at the program's start. Applicants to the online Ph.D. in social work program at St. Thomas must hold a master's degree in social work from an accredited program with a GPA of 3.0 or better in graduate coursework. In addition, the program requires a minimum of two years of post-master's social work practice. The St. Thomas program differs from other social work Ph.D. programs online in that it is intended for students who wish to teach at the university level or hold leadership positions at teaching-intensive colleges and universities. The University of St. Thomas is regionally accredited by the Higher Learning Commission (HLC). See more of the Best Online Doctorate in Social Work Programs. If you plan to earn your doctorate in human services online, make sure to research each program’s offerings to find a program that serves your academic interests and career goals. Although programs may focus on similar learning outcomes, each boasts unique course offerings and program formats. Explore what specializations a program offers. Some human services programs, for instance, offer concentrations in nonprofit management, gerontology, mental health, criminal justice, military families, or social policy analysis. Decide whether a program’s course offerings meet your career aspirations. Most human services doctorate programs offer a selection of foundational courses related to management, ethics and decision-making, and research methods, providing a blend of courses that explore human services and skills for effective organizational leadership. Beyond these foundational courses, programs may differ in what classes they offer and what they require of students. Some programs require a dissertation while others require workshops or professional residencies. Students looking to earn their human services doctoral degree online should consider these factors when deciding on a program that fits their schedule. They should also look into how long a program takes. Some schools offer accelerated tracks that help students earn their doctorate faster. This section explores the concentrations and course offerings typically found in online doctorate programs in human services. Although students can anticipate similar foundational course offerings, every program offers a unique curriculum. In this concentration, students learn to increase the efficiency of mental health services. They learn to serve as leaders in mental health organizations, applying research to create effective politics and change. In this concentration, students learn to manage nonprofit organizations that specialize in human services, exploring topics like diversity, governance, finances, ethics, and policy implementation. They learn how to address changes within nonprofits and achieve greater performance. In this course, students focus on human services related to the elderly. Students learn about health issues related to aging, exploring topics like home care and daily assistance. Students also learn about the psychology of aging and the societal and cultural influences of the aging process. In this course, students explore the historical context of human services, learning about the field’s origins and the ideas that shaped its evolution. They chart how political and societal influences affect the nature and delivery of human services. This course teaches students to review and assess the operations of a human services organization. Students learn how to complete and analyze a needs assessment survey and modify an organization that requires improvement. This course explores common ethical issues that arise in operations relating to human services. Students also learn to approach ethical decision-making. In this course, students learn about the organizational and leadership aspects of running a human services organization. They learn practical skills like how to recruit and retain volunteers, fundraise, market, and develop and implement policy changes. Critical to any doctoral program, this course teaches students how to design research ideas and apply relevant research designs to their own projects. Students study and critique articles, learn about data collection, and discuss ethics in research. Those who earn their doctorate in human services enter a variety of fulfilling careers. They can work in mental health administration, nonprofit management, and elder care, finding employment in homeless shelters, rehabilitation clinics, or halfway houses. They can also work primarily with certain populations, such as military families, abused women, or children. Whatever field they enter, their goal remains to improve conditions and services for people in need. Social and community service managers supervise and organize programs that serve the community, typically those housed within nonprofit organizations or government agencies. They oversee community service workers, locate funding opportunities, and organize outreach programs, working to improve programs and create more effective operations. Social and human services assistants typically help other social service workers support clients and their family members. They may assist social workers or work in rehabilitation clinics, connecting people with other means of support. They coordinate services for clients, such as applying for food stamps, and may help clients navigate activities as simple as eating and bathing. Training and development managers work with employees at an organization to increase their overall knowledge, productivity, and effectiveness. They develop and oversee staff training and manage training budgets. They pinpoint an organization’s goals and work with employees and training instructors to achieve these goals.